Our package for FreeCell enthusiasts is updated. As mentioned in my previous post, FreeCell Plus 4.02 was released at the end of last month, continuing the Goodsol Development autumn release party (which should continue into November). FreeCell Plus is a Solitaire game program available for both Windows and Mac OS X. It includes the best version of FreeCell, one of the most popular types of computer Solitaire, along with 11 similar games (8 of which are playable in the trial version). This free update fixes a few minor bugs on each platform and updates it to using the latest engine. 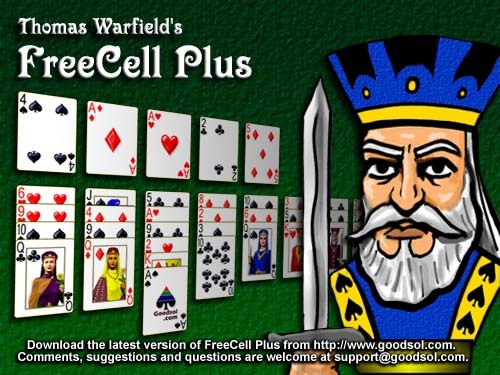 FreeCell Plus 4.02 is still available to purchase for the low, low price of only $9.95. So, where have you been for the last three weeks? Finally, and most importantly, I was working on a version of FreeCell Plus for a popular touch device developed by a company on Infinite Loop in Cupertino. Internally, we have a playable version in the prototype phase, and we are now actively working on our recliner-based test methods. Stay tuned to find out more in the near future. This entry was posted in Products and tagged game, iPad, Mac, software, Solitaire, Windows by Gregg. Bookmark the permalink.